Bob Boh was in his second year of graduate school at Tulane University when he was asked to teach a class there in Civil Engineering. He loved teaching and had received his masters in engineering, so he taught for a couple of years. A friend, Johnny Martinez, asked Bob if he’d like to go out with a friend of his sister’s and Bob took a chance on a blind date! As luck would have it, that friend was beautiful Katherine Sandoz, a senior at Newcomb College. They dated for a few months, then Bob went away that summer. Two weeks later, he returned and decided Katherine was the only girl for him. They went for a ride in City Park and he proposed! She said, “Yes!” and they went to celebrate at Bruno’s with all of their friends. 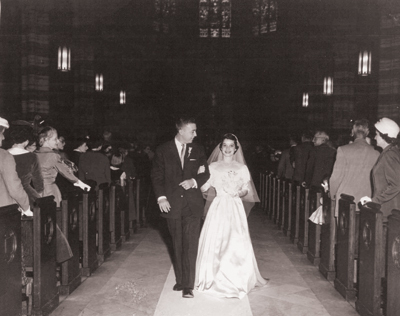 They were engaged in July and married on October 27, 1956. They first secured the church, Holy Name, and then the reception that was held at the New Orleans Country Club. The ceremony was held at 11 a.m. with Claude Kelly Jr. as best man with groomsmen Robert Bruce and Johnny Martinez. Katherine chose Arthe Walmsley as her maid of honor and Sylvia Brown from New Iberia and sister Jane Oelkers as her bridesmaids. Katherine’s dress was custom-made for her sister 10 years before, and she was the fourth sister to wear this amazing gown. She added her own veil and some beautiful lace. The bridesmaids wore Wedgewood blue dresses and had bouquets of deep maroon fall flowers – a suggestion of Donald Heumann of Rohm’s, who created all of the flowers for the church and the reception. After a lovely reception at the club for 300-400 friends and family, Katherine and Bob drove to The Edgewater Beach Hotel in Biloxi, Mississippi for two days and then on to the Grand Hotel in Point Clear. After they were married, Bob decided to work for Boh Brothers Construction Company, the business that his family started in 1909. Bob and Katherine have been married for 60 years in October and will celebrate their anniversary with all of their friends and family surrounding them!